When a goat puts its head down to graze, its eyes rotate in its head to keep its horizontal pupils parallel to the ground. That gives the goat, a prey animal with eyes on the sides of its head, a panoramic view of its surroundings - and keeps everything right-side up in case it has to start running, no matter which way its head is pointed. April Fools from your friends at BirdNote! The next time you see a goat, take a second to stop and wonder at its incredible eyes. Goats have horizontal pupils. 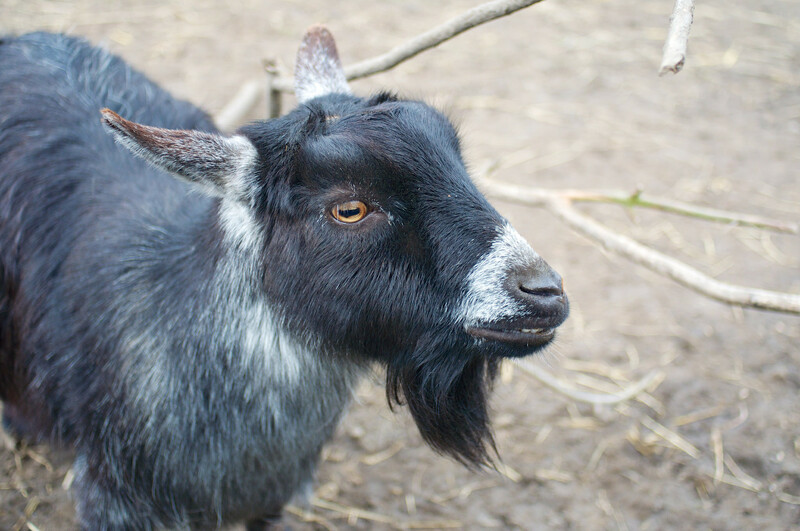 When a goat raises or lowers its head to eat, those horizontal pupils stay parallel to the ground. The pupil, of course, is the part of the eye that lets in light. Light reflects off the stuff around you, passes through your pupil, and gets projected on the retina at the back of your eye. And that’s the image that gets sent to your brain. So, why do goats have such different eyes? Finally, scientists at UC Berkeley think they have the answer. When a goat puts its head down to graze, its eyes rotate in its head to keep those horizontal pupils parallel to the ground. That gives the goat, a prey animal with eyes on the sides of its head, a panoramic view of its surroundings - and keeps everything right-side up in case it has to start running, no matter which way its head is pointed. So perhaps the humble goat has eyes that are, in fact, the Greatest Of All Time. Oh and one last thing… April Fools. For GoatNote -- I mean BirdNote -- I’m Michael Stein. Thanks to listener David Riggs. Goat sounds provided by The Macaulay Library of Natural Sounds at the Cornell Lab of Ornithology, Ithaca, New York. ML62970 recorded by GF Budney. Additionally, NatureSFX 130 Desert Morning Bird Chorus. BirdNote’s theme music composed and played by Nancy Rumbel and John Kessler. What do those weird pupils do?